Adelaide Town Hall, Tue 30 May. The Australian String Quartet returns to Adelaide Town Hall to kick off its 2017 season in style, and they brought a special guest in the form of renowned classical guitarist Slava Grigoryan, who, in addition to performing alongside the quartet for the first half of the program, was also married to ASQ cellist Sharon Grigoryan, nee Draper, this past December. The evening began with Ralph Towner’s Migration, the piece from which this national tour and the ASQ’s new CD take their name. Following a spoken introduction from violinist Dale Barltrop, the quintet went to work, with Slava Grigoryan attacking the ostinato patterns that underpin the opening section, before demonstrating his skill for the audience by delivering a series of lightning-fast solo runs. 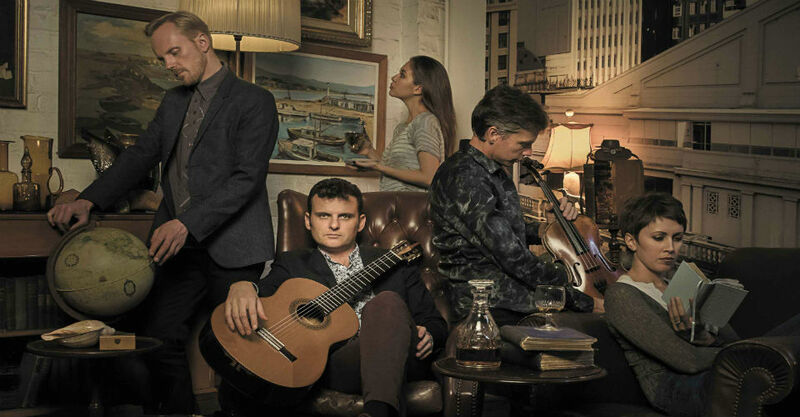 As the quintet continued, the performance settled into a more deliberate pace, with Grigoryan’s guitar again taking centre stage, accompanied by the somewhat discordant harmonies of the quartet. The musicians gradually gathered steam again, building to a raucous climax before softening to a gentle close. Next was Iain Grandage’s Black Dogs. As implied by the title, the piece was composed to evoke the experience of depression, with the guitar intended to embody the mind, and the string quartet the illness. Violinists Dale Barltrop and Francesca Hiew began the performance standing at the left and right fore corners of the stage, and it soon became evident that their placement was not merely for dramatic impact; indeed, the opening had them engaged in a musical stereo seesaw that was deliberately and effectively disorienting. However, this was but one of several sonic devices employed by the quartet to knock the guitar off-balance. Inevitably, the guitar could not help but react to the relentless provocations of the quartet, and the work became increasingly dissonant and violent until the quintet came to an abrupt and spectacular full stop, before retreating into the comparatively subdued postlude. The audience heartily approved, bringing the ASQ and its special guest back for repeated bows before the interval. The ASQ habitually offset their adventurous contemporary work with an equal dose of traditional classical repertoire, and this evening was no exception, with the honour falling to Franz Schubert and his final String Quartet in G major D. 887. Standing in a tight formation, the quartet set about bringing the nearly two hundred year old work to life. One thing that came across in the Schubert was the ASQ’s commitment to dynamic contrast; they purposefully alternated between whisper quiet and full volume along with every crescendo and diminuendo between, ensuring that the musicality was carefully attended to, and the effect was spellbinding. The second movement in particular showcased Sharon Grigoryan, her melody descending into a turn while answered by the violins and viola. While both violist Stephen King and the program made note of Schubert’s evident mortality influencing the work, in the room it felt vital and enchanting, and upon its conclusion, the Town Hall audience brought the ASQ back for bows twice. Slava Grigoryan and The Australian String Quartet – Migration is available on CD from the ABC Shop at shop.abc.net.au. Click HERE to purchase your copy.